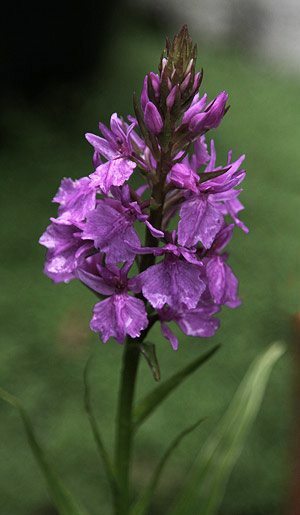 Dactylorhiza are a group of orchids known as ‘Marsh Orchids’. These are a deciduous orchid that grow well in cooler climates and most will grow in damp conditions. One outstanding cultivar is Dactylorhiza ‘Harold Esslemont’ (pictured right) and Dactylorhiza Fuchsii (Spotted Orchid) are also popular forms. D. maculata (Spotted Orchid), D. foliosa and D. majalis are other species. A terrestrial ( ground-dwelling) spring flowering orchid. D. aristata (Fisher’s Orchid or Key Flower) D. foliosa (Maderian Orchid) and D. purpurella Northern Marsh Orchid are all widely found. The species from Mediterranean areas are not as tolerant of wet winter conditions as those from the UK and Northern Europe. In terms of garden species and cultivars Dactylorhiz Fuchsii and the darker flowered Dactylorhiza ‘Harold Esslemont’ are two of the best. Often called ‘marsh orchids’ although D. foliosa is known as the Madeiran orchid. As the name ‘Marsh Orchid’ implies the species require a moist position, part shade is best with protection from afternoon sun.